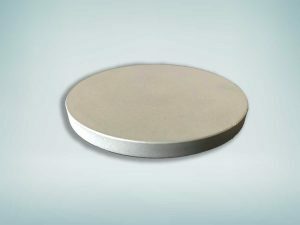 Princeton Scientific Corp. offers Sputtering targets made of - Metals, non-metals and chemical compounds with purity from 99.9% to 99.9999%. We offer standard, single element pure metals and custom compounds. Various geometric shapes; round, rectangular, as well as multi-tile and stepped constructions are possible. Please review our standard and specialty target list for more information. Princeton Scientific can produce sputtering targets to your specific needs. We will help to select appropriate target material, fabrication process, and bonding assembly that insures the success of your thin film deposition process. Our Sputter targets are prepared either by a melt- or a powder metallurgical process. We also provide an assorted array of backing plates for your systems requirements. Also, our bonding services include various metallic or silver epoxy techniques. BaTiO3 HfO2/CaO MgO SrTiO3 ZnO dop. Bi2O3 HfO2/Y2O3 MoO3 SrZrO3 ZrO2 unstab.